Nuclear thermal rockets like the one in this artistic rendering could halve the time needed for a Mars mission. Dangerous radiation. Overstuffed pantries. Cabin fever. NASA could sidestep many of the impediments to a Mars mission if they could just get there faster. But sluggish chemical rockets aren't cutting it — and to find what comes next, one group of engineers is rebooting research into an engine last fired in 1972. The energy liberated by burning chemical fuel brought astronauts to the moon, but that rocket science makes for a long trip to Mars. And although search for a fission-based shortcut dates back to the 1950s, such engines have never flown. 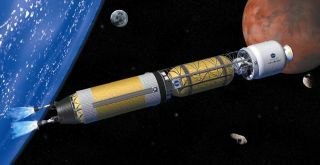 In August, NASA boosted those efforts when the agency announced an $18.8-million-dollar contract with nuclear company BWXT to design fuel and a reactor suitable for nuclear thermal propulsion (NTP), a rocket technology that could jumpstart a new era of space exploration. NTP rockets would pull all that off by offering about twice the bang for the buck that chemical rockets do. Rather than burning fuel with oxygen, a nuclear fission reactor would serve as a powerful furnace, heating liquid hydrogen and expelling the resulting gas for thrust. How much oomph a rocket gets from its fuel depends largely on how fast it can hurl particles out the back, which in turn hinges on their mass. And NTP's single or double hydrogen atoms would be up to a dozen times lighter than chemical rocket outputs. That atomic bean counting could add up to significant time savings. "Nuclear thermal propulsion can enable you to get to Mars faster, on the order of twice as fast," said Vishal Patel, a researcher involved in subcontract work for BWXT at the Ultra Safe Nuclear Corp. in Los Alamos, New Mexico. "We're looking at nice 3- to 4-month transit times." Unlike truly exotic propulsion proposals using antimatter or nuclear fusion, researchers have long considered nuclear fission rockets technologically feasible. Concrete development began with the Atomic Energy Commission's Project Rover in 1955 — three years before NASA's founding — and continued with the NERVA rocket prototype, which fired for nearly 2 hours straight during ground tests before budget cuts ended development in 1972. By then, NASA had already canceled Apollo 18 through 20, as well as Saturn V rocket production. When Mars plans followed suit, the multibillion-dollar NERVA project lost its main purpose, Houts said. The technology saw a brief revival in the late '80s and early '90s with the Space Nuclear Thermal Propulsion (SNTP) program, which also ran out of funding before flight testing. But now, with interest turning back toward Mars, past research is finding new life in current projects. "The key thing is, [the NERVA rocket] was extremely well documented," said John Helmey, project manager for BWXT's NTP project. "We aren't starting from scratch. We're building upon really good work that was done back in that time frame," he told Space.com. Over the course of the contract, which extends through 2019, BWXT will develop conceptual designs focusing on fuel elements and the reactor core. Three main challenges distinguish modern efforts from the legacy research. Nuclear-testing rules have changed, said Jonathon Witter, BWXT NTP project chief engineer. The potential for trace levels of radioactivity in the engine exhaust means that engineers can no longer let clouds of hydrogen gas billow into the atmosphere. Instead, BWXT plans to test a trick developed at NASA's Stennis Space Center and combust the hydrogen gas with oxygen to make easy-to-catch water. Early, small-scale demonstrations will use non-nuclear hydrogen gas to test this exhaust-capturing method, but water from future nuclear tests could be decontaminated with off-the-shelf technology. Engineers are also redesigning the fuel elements with new materials surrounding the uranium fuel particles, according to Witter. Rocket efficiency depends on temperature too, and BWXT expects that a ceramic and tungsten composite will allow for better operation at higher temperatures. What's more, NERVA ran on 90 percent highly enriched uranium that would today qualify as weapons-grade. But because the fission process throws off more than enough heat, those levels are overkill, Patel said. BWXT's designs will harness material enriched to just below 20 percent, putting it in the less-tightly regulated low enriched uranium (LEU) category. On top of allowing safer reactors, the modest levels of fissionable material could open the door to more public-private partnerships. "The LEU thing really enables the idea that non-governmental entities can get in on this," Patel said. "It's potentially game changing." But extensive design and many years of testing separate NTP's on-paper potential from single-season jaunts to the Red Planet, and nuclear space technology's history of false starts makes it a long shot for NASA's early Mars missions, currently scheduled for the 2030s. "It's one of several advanced propulsion options, Houts said. "There're a lot of good options that use chemical systems, and options that use electric propulsion." Scott Hall, a developer of one such electric propulsion prototype that recentlybroke records at the University of Michigan, says he'd love to see any of these technologies get into space, but doesn't think it'll happen soon. "Optimistically, it will be 15 years," Hall said of his high-powered ion thruster, "and realistically it's probably more like 50… The process is just moving so slowly, and I imagine the nuclear guys are in a similar boat." But whether it takes one decade or 10, Houts thinks nuclear technology could transform space exploration. He cites Martian power plants and the possibility of spacecraft that refuel from naturally occurring resources like water or methane as examples of far-off possibilities. "What we're talking about is a first generation system. The systems beyond that could have extremely advanced capabilities," he said.